By taking stock of global consumption, Vital Signs 2012 offers the facts that need to guide our stewardship of the Earth's resources-and some of these facts are shocking. The report covers topics from obesity to ecosystem services, from grain production to nuclear power. Taken as a whole, it paints a picture of skyrocketing population, disappearing forests, and increasing consumption peppered with bright spots like growing investment in high-speed trains and other efficient transportation systems. 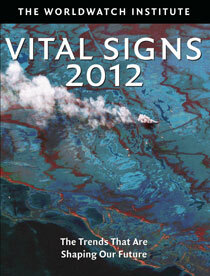 Vital Signs 2012 is based on Worldwatch's online project of the same name, which provides up-to-date figures on important global concerns, as well as the Institute's own additional research. The book compiles the most important of these into an accessible, informative resource for policymakers and anyone who wants a realistic look at the state of our planet. "Each trend report is concise, using quantitative metrics and graphs to assess and present the trend in a few pages." "These lines that tie the world together are surreptitiously hidden just beyond our field of view, but Vital Signs does an amazing job of bringing everything into focus."